3 DVDs · 6 hrs. NEW! IN STOCK & READY TO SHIP! Statistics isn’t just for math majors: now it’s taught in high school, and it’s even a required course for many college degrees in psychology, sociology, business, economics, engineering, and other fields! Now you can master this course quickly and easily with Video Aided Instruction’s Statistics. 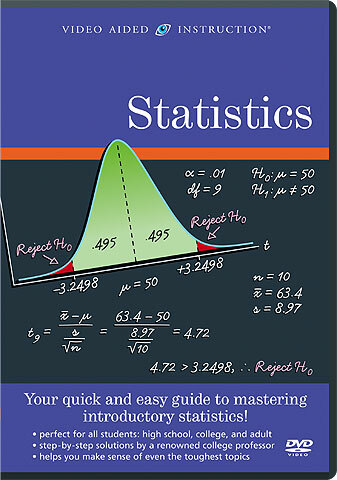 The ultimate resource for AP high school students, college students, and adult learners, this set covers the standard topics taught in introductory stats classes and is jam-packed with practice questions and strategies for tackling even the most complicated problems. Now it’s easier than ever to overcome math anxiety, earn high grades in school, or relearn forgotten mathematics — all with your own private teacher! Copyright ©2007 Video Aided Instruction, Inc. All Rights Reserved.